Speaking of cephalopods which have surprised by not being too heavy to fly after all, I was reminded of one little cuttlefish who is actually too heavy to swim: Metasepia pfefferi, or Pfeffer's Flamboyant Cuttlefish. With the scientist's charming penchant for repurposing ordinary adjectives, biologists describe the body of this little fellow as "robust," which means that it is chubby in all dimensions. It may sound insulting to keep calling it heavy and chubby, but actually these features make for a very cool trick. The Flamboyant doesn't swim and hover midwater like other cuttlefish. Instead, it crawls on the seafloor like an octopus. This behavior is related to its reduced cuttlebone. A cuttlebone is the "skeleton" of a cuttlefish, intermediate between the robust shell of a nautilus and the slender pen of a squid. It's internal like the pen, but calcified and chambered like the nautilus shell. These chambers are full of gas and liquid, the relative concentrations of which the animal can alter in order to change its buoyancy. Because of its extra-small cuttlebone, the Flamboyant has a hard time with buoyancy. It can't swim for very long without sinking to the bottom. But what it lacks in buoyancy, it makes up in flambuoyancy! I want to be an octopus, I want it so bad. Not only does it crawl around the bottom like an octopus, it's the only one of the only non-octopus cephalopods found to be toxic. The bright colors and distinctive posture are probably a warning display, speaking a language that seems to be universal across the animal kingdom: Stand back, I'm toxic, don't eat me! Here is a truly rad video with some fun facts about the Flamboyant. 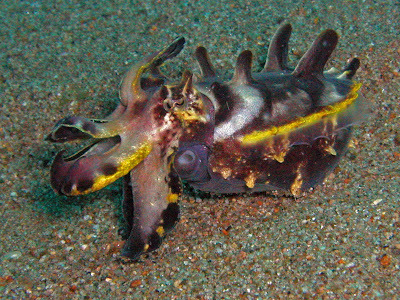 The only correction I would offer is that the bite of this cuttlefish isn't known to be venomous. Rather, toxin is found in its muscle tissue, making it more like a pufferfish than a blue-ringed octopus: poisonous, not venomous.